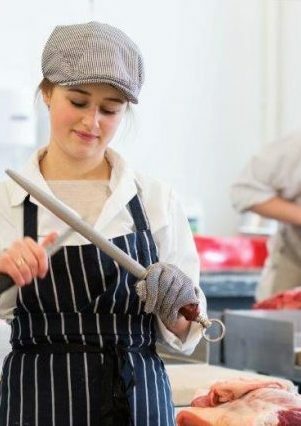 Farmer’s daughter Hannah began working at Marley’s Butchers in Ripon as a Saturday job when she was just 14 years old. 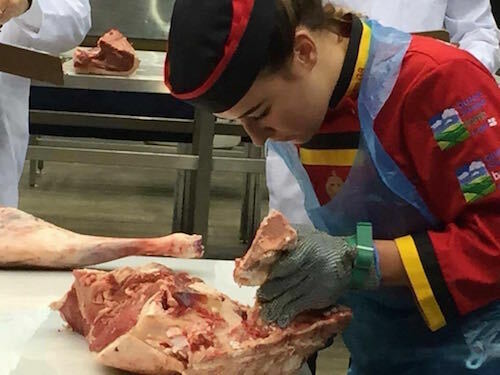 She is now 17 and an Apprentice on the Level 2 Butchery Standard. She has worked full time at the shop for the last 18 months, combining this with her study at Leeds City College. What made you consider a career in Butchery? I’d actually always wanted to be a vet but I wasn’t the most academic student. I preferred being at work or helping out on the farm – I’m very practically minded. From working Saturdays at the Butchers I could see that it was a skilled job and that’s what I was after. When my boss offered to take me on and help me learn the trade I jumped at the chance. Where did you hear about the new Level 2 Butchery Trailblazer Apprenticeship? A colleague at our sister shop had studied at Thomas Danby (now Leeds City College) and as there was an open evening coming up I went with my parents to find out more about it. We were all really impressed with how thorough the apprenticeship was and how much I’d be learning. How long have you been studying for the Butchery Apprenticeship and when do you expect to complete it? I started college in September 2015 and aim to complete the apprenticeship in June 2017. I don’t plan to stop there though. I plan to get further qualifications – who knows; one day I might even make Master Butcher! How has the apprenticeship helped you in your day to day job as a butcher? It’s helped me in so many ways, but from a practical butchery point of view I’ve learnt lots of new boning techniques that I’ve been able to put to good use in the shop. The logbook I’ve needed to complete, although time consuming, has also been a good way of recording my learning and helping me stay on track to qualify in June. What have been the high points in your career as a butcher so far? 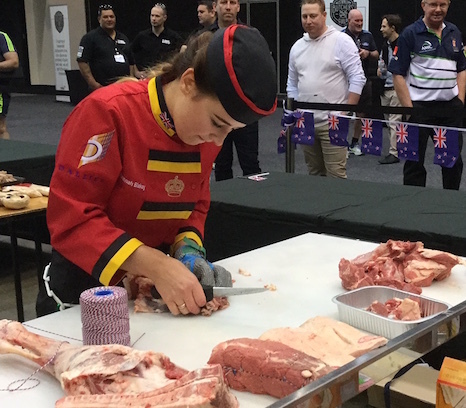 It has to be the competition work I’ve been involved in – especially going to Australia last September to compete in the World Butchers Challenge with the British team, the ‘British Beefeaters’. I came second in my stage of the competition, and have since gone on to be a finalist in the WorldSkills Butchery competition at the NEC in Birmingham. Although I didn’t win the title I was very proud to be both the youngest ever finalist and the first woman to make it to the final. Competitions teach you a lot about presentation and working accurately at speed. Well, I want to go as far as I can competing as a professional Butcher. In fact, I will be competing in the Lifeline Young Butcher Competition in Perth, Australia which I’m really excited about. Most of all though I’d like to run my own farm shop. I’m very lucky as my family are willing to support me in this, which makes me even more determined to succeed. What advice would you give to any young person considering a career in Butchery? I would say drive yourself, it’s so worth it! At school I was told I would be nothing but I have got much further in my career than many people I know. It’s nice to be able to prove people wrong! View BBC Yorkshire video clip of Hannah before leaving for Perth. Hannah came 2nd, see her in action at the Lifeline Young Butcher Competition.